Green Monster by Zambeza is one of these excellent autoflowering strains where pretty much everything is “just about perfect”. Her great taste, superb high and then her decent yields and the easiness to grow her make it difficult to find a flaw. Her compact size and fast growth make Green Monster a top choice that you can grow everywhere, including balconies, roof terraces and small grow tents. Zambeza crossed a Green Monster with a big Big Devil 2 and gave her ruderalis genetics to bring us this outstanding autoflowering variety. Despite her name, Green Monster doesn’t really get too big. Indoors, she will reach a height of 60-90cm and outdoors she can grow somewhat taller, up to a maximum of 120cm. Her compact size and her short life cycle of only 55-60 days to harvest make Green Monster an ideal plant to grow almost anywhere. Grow her on your balcony, roof or basically any spot where she can get some sun and she’ll thrive. When you grow her indoors, get ready to some decent yields of 300-350 g/m² with outdoor yields of up to 120g per plant in ideal conditions. Green Monster has an excellent and very interesting flavour profile that blends a plethora of different aromas perfectly. Her flavour contains sweet and spicy aromas with some sprinkles of refreshing citrus and lime flavours on top making for a very pleasant smoke that cannabis connoisseurs will love. With her aroma already truly first-class, her effect doesn’t leave anything desired either. She gives a nice classic “happy high” that is very relaxing at the same time. The fact that Green Monster “only” has 15% of THC makes her effect not too strong, but still potent enough so you can enjoy an all-around awesome high any time of the day without being knocked out. 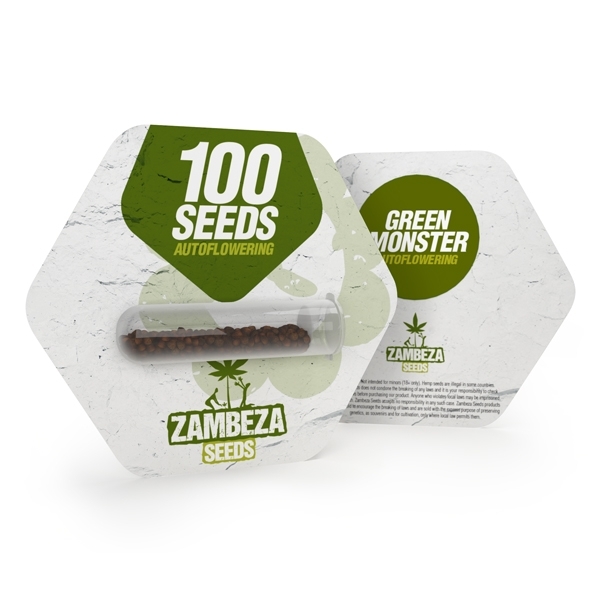 Green Monster Bulk Seeds by Zambeza make for an all-around extremely satisfying autoflowering indica that won’t disappoint. Grow this compact, easy and fast-growing autoflower and you won’t be disappointed! You can get Green Monster Autoflowering Bulk Seeds at Zambeza in packs of 100 seeds each.